On 21 September 2018 the Department of Environmental Affairs (DEA) released an official press release with the latest statistics on rhino poaching. 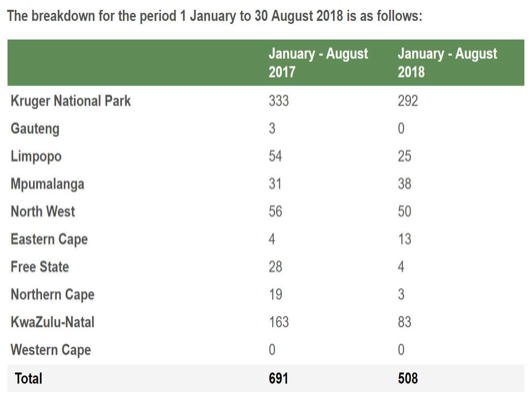 Below is the breakdown of rhino lost in the various provinces for the period January to August. It’s extremely encouraging that we have observed a decrease in poaching statistics over past few months. 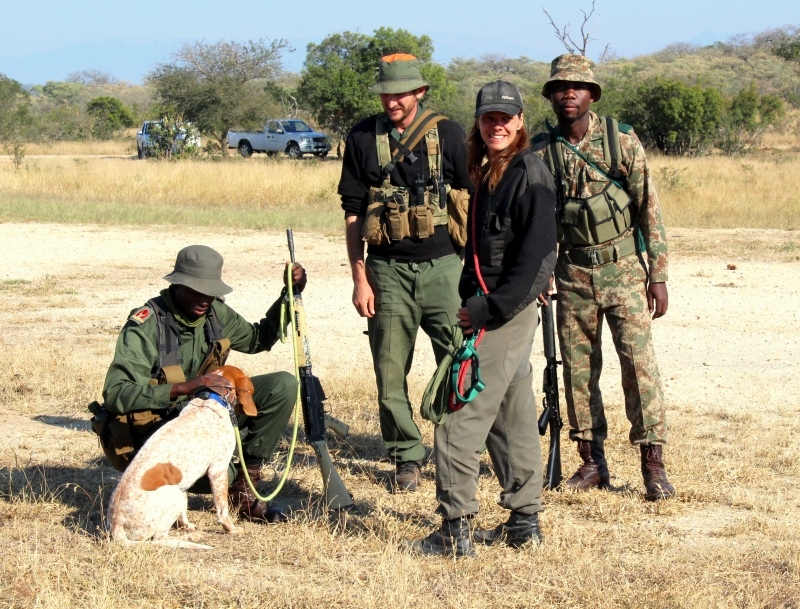 The success of the free-running pack hounds at the SAWC’s K9 unit have certainly had a huge role to play within the Greater Kruger National Park. Since February this year, and with the addition of the new packs from Texas in July, 51 poachers have been arrested and 21 firearms have been seized within the Greater Kruger National Park. With most of these arrests, the work was preventative with only eight rhino having lost their lives prior to the arrests. According to the statistics released there has been a decrease in the number of rhino poached nationally compared to the same period in 2017, with nearly all provinces experiencing dramatic declines. Between 1 January 2018 and 31 August 2018, 508 rhino were poached, compared to 691 for the same period in 2017. Rhino poaching numbers in the Kruger National Park (KNP) also continue to decline. In the period under review, a total of 292 rhinos were poached, compared to 332 in the same period last year. This decline comes despite a dramatic escalation in poacher activity inside the Park, ranging from sightings, to poacher camps found, to incursions. A total of 1873 incidents were recorded in the period under review. This is compared to 1 702 in 2017. It is also particularly pleasing to note the decline in the numbers of rhino poached in Kwa-Zulu-Natal (KZN) during the period under review. In the same period in 2017, 163 rhinos were poached, whereas this year the number stands at 83. This is extremely noteworthy and Ezemvelo KZN Wildlife, working in collaboration with the South African Police Service (SAPS), are to be commended. In addition to the arrests effected by Operation Rhino 9, a total of 13 wildlife traffickers (five Chinese nationals and eight South Africans) were arrested between 1 January and 31 August 2018 by the Hawks. These Level 3 and 4 traffickers were en route to China, Hong Kong, and Vietnam at the time of their arrests. More than 60,92kg of rhino horn was confiscated and linked to poaching crime scenes in KwaZulu-Natal and the Northern Cape. For the Kruger National Park, the number of arrests of alleged poachers stands at 162 for the period 1 January 2018 to 31 August 2018. A total of 145 weapons have been seized in rhino-related incidents both inside and outside the KNP since the beginning of 2018, and a total of 83 rhino horns have been confiscated in the same period. It is still of concern that inside personnel are being arrested for rhino poaching-related offences. Since January, four officials have been arrested by SANParks enforcement staff in the KNP for poaching-related offences. This includes members of the SAPS and the South African National Defence Force (SANDF). Since SANParks introduced integrity management throughout the organisation to support ongoing anti-poaching efforts, a number of officials has been dismissed following disciplinary processes. A number of these have also faced criminal charges. One of the challenges facing new enforcement when it comes to poaching-related offences is that suspected poaching kingpins and syndicate members hide and even dispose of the proceeds of their alleged activities as a result of lengthy trial delays. A welcome development is that a number of rhino poaching-related cases are now being dealt with by the Asset Forfeiture Unit (AFU). There are currently 530 rhino poaching-related cases on the court roll involving 750 accused and 1 738 charges. Close to 300 of these cases are trial-ready. The charges range from rhino poaching, to rhino horn trafficking, to the illegal possession of firearms and ammunition. From January to August 2018 a total of 70 cases, involving 163 accused were finalised. The trials have resulted in 93% guilty verdicts, translating to 288 years in sentencing. Translocation of rhino has proven to be an effective tool in enhancing the safety of these animals, encouraging population growth and expanding rhino range. The emergence of bovine tuberculosis in rhinos in Kruger, however, has placed some constraints on the full benefits of white rhino strongholds. SANParks is now using innovative ways to overcome risks associated with diseases. The integrated initiatives of SANParks to manage its rhino population have had varied successes. In some of our national parks, black rhinos of both sub-species are increasing and these parks now include an estimated 63 south-central and 199 south-western black rhinos. The Kruger National Park still has the stronghold and in 2017 the black rhino population in the KNP was estimated to be between 427 and 586 animals. As such, it appears that SANParks’ Black Rhino Guardian initiative has contributed to halting the decline in black rhino numbers in the Park. White rhino numbers in the Kruger National Park, however, continue to decline, with the population estimated at between 4 759 and 5 532 animals during 2017. White rhino, unlike black rhino, were also affected by the drought – with natural mortalities increasing from 1% to 1.5% during the drought, while the birth rate dropped from approximately 9% to 5% following the drought. It must therefore be noted that whilst poaching numbers decline, so too do the number of remaining rhino which is primarily due to poaching, but also includes other natural mortalities and impacts. In line with requirements in the Convention for the International Trade in Endangered Species of Wild Fauna and Flora (CITES), the DEA has recommended the export of a total of 538 live rhinos from South Africa since 2014. The exports were both for zoological purposes and for reintroduction to range states. The majority of the exports (361) were to former and existing rhino range states, including Botswana, Chad, Namibia, Rwanda, and Zambia. It is hoped that by creating a legitimate economy for communities, particularly those in the rural areas where most of our national parks are situated, people will be deterred from rhino poaching-related activities. Giving residents a stake in natural resource management and ownership will enable poverty-stricken communities to access greater economic opportunities. This is one of the aims of the government’s National Biodiversity Economy Strategy (NBES). The 3rd Biodiversity Economy Indaba (BEI) hosted by DEA earlier this year ended with pledges by stakeholders in the wildlife, bioprospecting and bio trade, and ecotourism sectors to ensure greater inclusivity and transformation of the sector. International cooperation is a critical component of our overall response strategy to the scourge of wildlife crime. In this regard, we have continued to cooperate with a number of strategic partners across the world and activities are being implemented in terms of our existing MoUs. Significant progress has been made with the implementation of the MoU between South Africa and Mozambique.